Cricket Wireless started as a small, privately owned network that was loved by its customers because of their low prices, fair approach, and desire to fill a big gap in the market. Their only problem was limited coverage that simply couldn’t compete with some of the biggest carriers in the United States. This problem was solved when AT&T finalized their acquisition of Cricket in spring 2014. Cricket Wireless would become their cheap, no-contract option for people who appreciate the simple billing structure and potential savings. It’s in direct competition with the likes of Republic Wireless, Walmart’s pre-paid plans, and many others. Continue reading to find out how Cricket Wireless does under large wings of AT&T. Cricket Wireless leverages the power of AT&T’s fast 4G LTE network, which greatly improves the previously bad performance of the CDMA network that Cricket used before their acquisition by AT&T. The coverage is essentially the same as the one you get with AT&T. You can check if your location is included using their online tool. Just enter the name of your city or state, and it will show what type of connection is available. Download and upload speeds are on par with other providers, averaging at around 7 Mbps and 3 Mbps respectively. This may, of course, vary depending on your location and current network availability. We’ve heard reports describing various issues with high latency, but no such issues were observed during our testing. 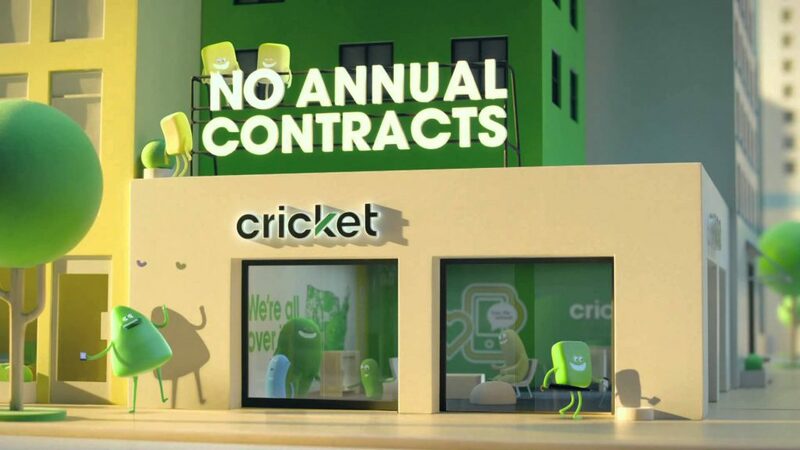 Cricket does things exactly like many other prepaid providers and allows their customers to either purchase a brand new phone from their own store or bring one they already own with them. The available phones include some ultra-affordable options that cost basically or completely nothing and also a handful of top-of-the-line devices for demanding customers. Apple iPhone 6s Plus: This premium smartphone from Apple is best suited for demanding customers who appreciate its elegant simplicity combined with an amazing collection of useful applications and entertaining mobile games. The sharp camera capable of shooting 4K video footage will help you capture all important moments of your life, and the built-in fingerprint sensor will keep them protected against intruders. Samsung Galaxy S6: Apple’s biggest rival, Samsung, is also represented in Cricket’s range of mobile devices. This beautifully crafted smartphone features top-of-the-line hardware and delivers what can be considered to be the best Android experience currently available. Motorola Moto E: The Moto E is an affordable option for people who want all the bells and whistles of expensive smartphones without making their wallet cry. Even though sacrifices had to be made somewhere – namely in the quality of the camera and processor speed – the overall value is sky-high. Microsoft Lumia 640: It’s always great to see less widespread operating systems, such as Windows Mobile, getting some attention. The Lumia 640 is a great alternative to budget Android devices. It’s fast, efficient, and the Windows Mobile Store is steadily growing in size with each passing month. ZTE Altair 2: The Altair 2 from ZTE is an inexpensive QWERTY phone designed around fast text communication. It’s a good choice if you use your phone mostly to make voice calls and send messages and not a small computer/entertainment machine. Apart from smartphones, Cricket Wireless also sell a wide range of accessories, including screen protectors and cases. That way, you can get everything together during your purchase and not worry about it later. If you already own a perfectly good smartphone that still has plenty of life in it, you’ll be pleased to know that Cricket Wireless allows you to bring your own device to the service. You need to make sure that the phone can run on their network by imputing its IMEI number into a dedicated compatibility checker. After you get a positive result, you need to order a Universal SIM Card Kit for about $10 and activate the service. Everything is well explained and the entire process won’t take you longer than just a few minutes. Basic ($40/mo): Unlimited talk and text. Comes with 2.5 GB of data. Doesn’t include unlimited international texting and unlimited talk and text to and from Mexico, Canada, and the U.S.
Smart ($50/mo): Unlimited talk and text. Comes with 5 GB of data. Pro ($60/mo): Unlimited talk and text. Comes with 10 GB of data. If you manage to exceed the allotted data limit, you can do two things: live with slower GSM transfer speeds or purchase an extra 1GB for $10. This purchase can be automatically repeated each month or used just once to get you through a period of heavier data use. The company is rewarding their customers for using their service each month by giving $5 discounts to everyone who signs up for their Auto Pay service. The service works with most credit and debit cards, such as Visa, MasterCard, Discover, and American Express. You can get extra credit card points and save up to $60 over the course of the year. Even though there are no dedicated family plans, Cricket Wireless is actually an amazing family plan, thanks to the $10 discount on every additional line. This discount adds up, which means that you get $10 off for the second phone and $20 off for the third one. The maximum number of lines is limited to four. Cricket Wireless isn’t the best cellular provider in terms of the quality of its customer service, but it’s far from being the worst one. According to J.D. Power and Associates survey of customer care, Cricket Wireless is voted third best. PCMag.com Readers’ Choice poll placed it right in the middle of the competition. These results have certainly a lot to do with how clean and clear the support page is. Everything is conveniently broken down into various categories, which contain individual topics with detailed explanations written in an easy-to-understand language. You definitely won’t be confused by obscure technical jargon. If the support page doesn’t contain the answer you are looking for, you can head over to Twitter and contact one of two accounts available: the Cricket Wireless official Twitter account or the Cricket Support account. Both accounts are constantly monitored by qualified employees who are ready to help you with every problem you might have. More complex issues are best solved on the phone, and Cricket Wireless has enough lines open to never leave you waiting for too long. The rest of our experience was also positive and completely painless, unlike what we’ve experienced with many other pre-paid carriers. Cricket Wireless is a simple and affordable option that doesn’t overwhelm customers with a lot of confusing options. The reliable coverage of the AT&T network ensures great signal strength and high availability. Their family discounts are good enough reason to switch the whole family and enjoy the simplified billing and lower monthly phone expenses.